Discovering, collecting, and appreciating art is a road to self-discovery. What you like. What you don't. The feelings you feel. The feelings you don't. Art makes your soul grow, as Vonnegut once said. 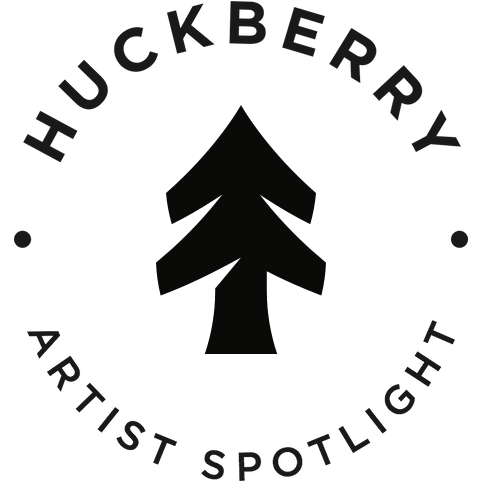 It's why we've created the Huckberry Artist Series, a partnership with some of our favorite artists to share their stories and create one-of-a-kind, limited edition prints, posters, and tees. 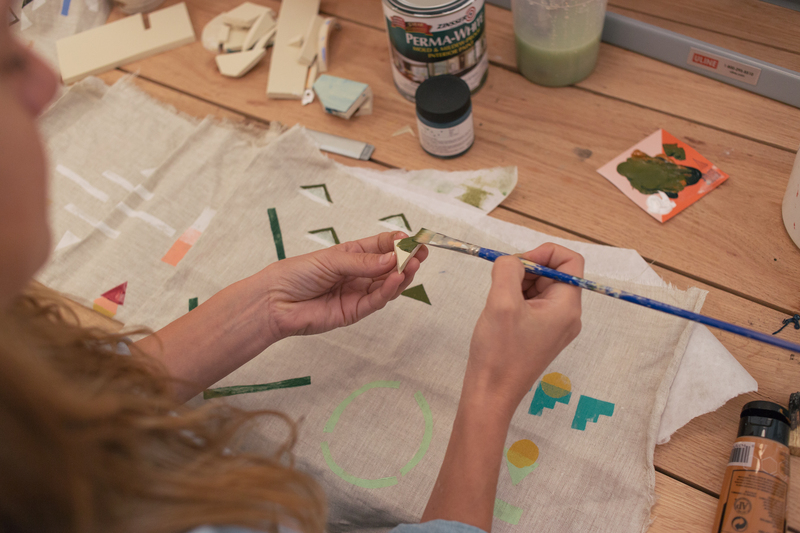 Our exclusive Huckberry Artist Series continues with Caroline Hurley, painter and textile artist based in Brooklyn. 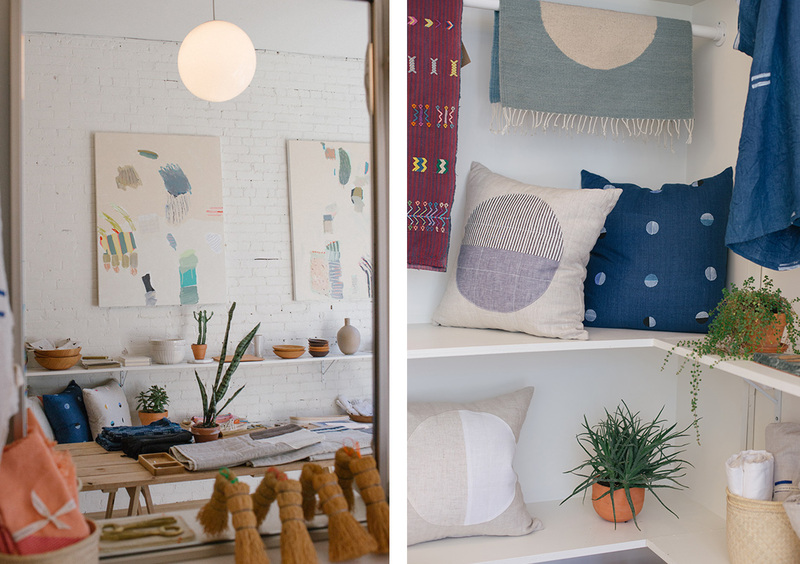 Caroline's designs are light and minimal, and always inspired by her travel around the world. 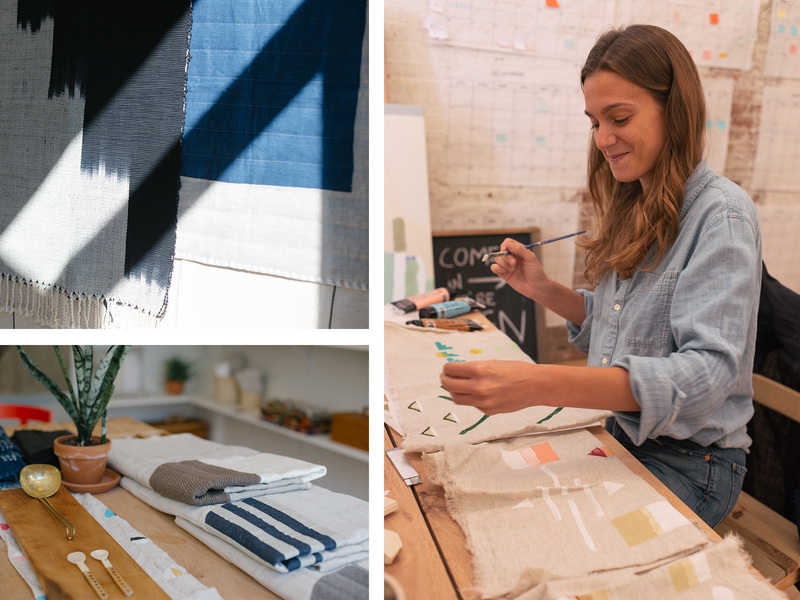 All of her textiles are made by hand with the same commitment to craft that's been the cornerstone of her work from the beginning. 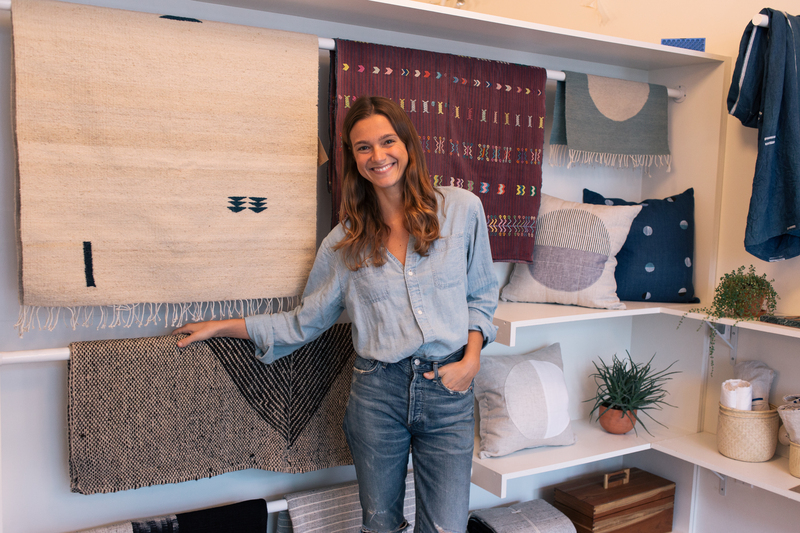 We caught up with Caroline in her Greenpoint studio to talk about staying relaxed while running a business, travel and the pillows, blankets and throws she created exclusively for Huckberry. 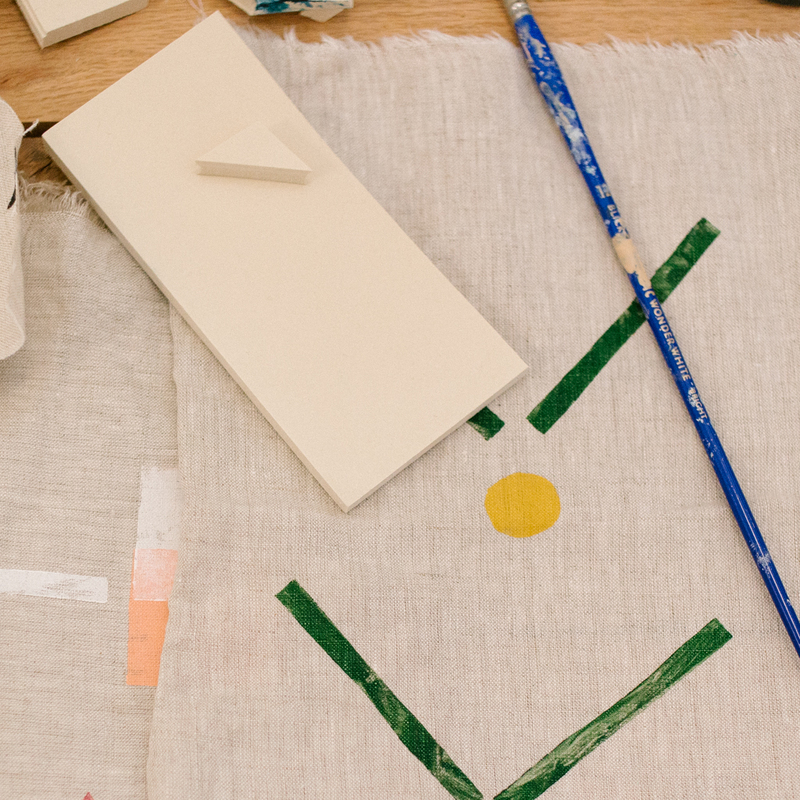 "It's important to take the time to make things just to make things." So tell us about the Huckberry collaboration. We made a collection of pillows, blankets and throws and all of them are slightly more masculine than what I typically design. Like everything I make, they’re pretty basic shapes with a lot of negative space. I was inspired by the colors of the Redwood Forest for this collaboration. Where are the items made? Can you tell me a little about the process? 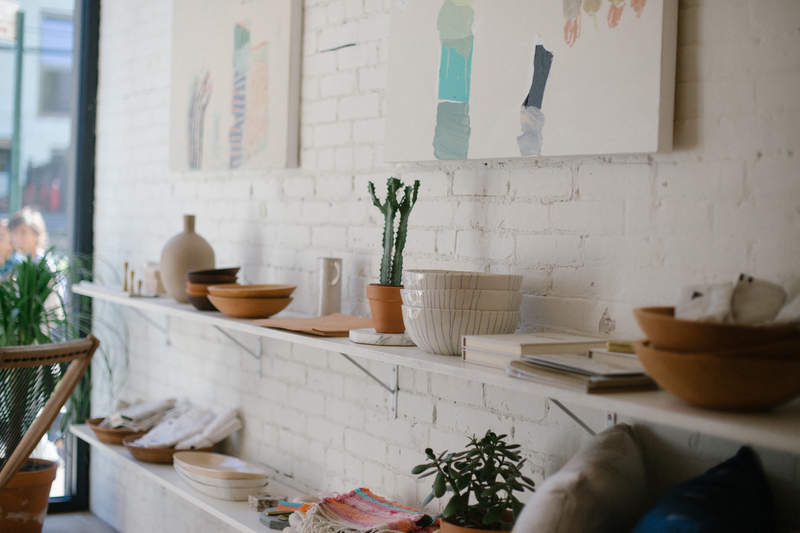 Everything for Huckberry is made through our artisan group in New Bedford, Massachusetts. When I first started my business, I was block printing everything by hand on my own. When I got my first big order, I realized I needed manufacturing. So I did a lot of research and found a group of Guatemalans in New Bedford who were actually weavers. They were the first group I met that really wanted the work, and they were willing to be trained. So I sat with them and taught them how to block print everything, and now they’re the sole producers of all my block-printed work. We’ve been working with them for three years. We carve the linoleum stamps and then we hand block-print each individual shape. It’s a really labor-intensive process. Because every stamp is printed individually, each product is going to have slight variations and I think that’s what makes it special, you can feel the hands that made each piece. Tell me a little about how you got into design. It was through art right? I am a painter. I went to school (RISD) for painting, and I still consider myself to be more of a fine artist than a textile designer or business owner. For me it's not about making sales, it's about making things. I started block printing after a trip to Bali. I had these block-printing supplies in studio and I incorporated them into my paintings. One thing led to another and I made a throw. I brought it to my favorite shop at the time (it was called JF & Son) and they wanted to sell them, which was just so exciting to me! So I started sending them fresh new block-printed items from my studio and they started to sell, and then I began to get other inquires from other shops about the product. It was a pretty organic process. Generally, I believe in letting things flow to you. When things feel easy, my belief is that it means you are on the right track. I am sort of over this idea that things have to be hard in order for you to be successful. Don’t get me wrong, I believe in hard work and setting intentions, I just don’t buy into the fact that struggle is a necessary part of the process. I definitely used to think that was important, but as I get older I am just over that way of thinking. Life is supposed to be fun! If it's not fun, if you don’t feel passionate about it, LET IT GO! Eventually I was able to quit my day job and focus solely on textiles, which I love. I love that it allows me to still be creating. The thing, for fine artists and designers, is you live your whole life to pay for what you really want to be doing. You have these day jobs that are sometimes totally unrelated to your true passion. I had a lot of odd jobs that helped me pay for my art practice and I finally found something that allowed me to stay in studio. All of those odd jobs were super important to getting me where I am. You can’t know what you want until you know what you don’t want. I have been obsessed with textiles for as long as I can remember. In highschool, I had a business where I would take old scraps of fabric cut them all up and make these floppy flowers that you could pin onto things. And then at RISD my thesis was all about piles of textured laundry so it makes sense that I have a textile company! Describe your workspace for us. Right now, I have a shop in the front and a studio in the back. My studio space is more of an office right now – it's where we strategize, do our logistics, emailing, coordinating with production and our distribution, planning, etc. I design and paint in the studio too, but I am laying down the foundation to grow my business in a really systematic way, so the studio is more about me and my team strategically figuring out the next steps for my brand. It feels sort of like a tech lab, I’m doing these charts and graphs and surveys to figure out how my customers engage with the product, how to tell my story, how to get my production online, and how to capture the feeling of what I make through imagery and stories. And it's so fun! I do have a section for painting and creating in the studio, but right now my creative process is focused on the brand. That being said it's important for me to take the time to make things just to make things (not necessarily to sell) and that’s why I do art residencies. I have two coming up this winter - one is in Mexico and the next is in Sausalito. Let's talk a little more about how you come up with the designs. Is it cutting the blocks and playing with them, or do you sketch things out first? How does it work? Every collection that I make is based on a city. I know that seems to really silly to a lot of people, because a lot of what I do is so simple and so shaped-based. But I’m such a vibe-y person — when I go to a new place and see new colors and meet new people and experience new cultures, it really opens me up. And that’s where I design these collections from. So even though they are in the same language, they’re coming from a specific place of inspiration. When I’m in a new city, a lot of it is absorbing the color that’s there and then compiling it when I get back to the studio — playing around with shapes and mixing and getting to something that feels like the same feeling I had when I was in that city. For Huckberry, I did some research into the customers. I know there are a lot of people who enjoy the outdoors, which is a great thing for me, because so do I. I looked at images of the vastness of the Redwood Forest and collected visual information on a hike I had done in Cold Spring, NY. I came back to New York and started combing shapes and colors and the collection was born. I think my products are really well-suited for people who enjoy the outdoors. I always travel with one of my throws to put around me on a plane, or put on my bed when I land somewhere. And to be outdoors in nature and to have a cozy blanket, that seems super ideal to me. What do you do to relax when you’re not in the studio? I’m actually really into meditation right now. I have been for the last three years. Every morning I meditate and I try and do yoga a couple times a week too. I feel like that's where the best stuff comes from. That’s the place where my creativity is at its best and it's also where the answers to business questions come from too. I’ve found with launching new collections and changing things internally in my business, that it’s so much easier if you just give up the doubt. The more effort I put into quieting my mind, the more I can get to where I want to be. It takes practice, but it's been so important for me as a business owner. Yeah, it’s hard to induce a meditative state when you're running in and out of subways all day. That's why you've got to get out every now and again! Traveling really keeps me present. I was in San Francisco last weekend, we were walking around and we were so engaged. You see something new—these new streets and new alleyways—and you are forced to just be there and see things. When I’m in a new place, I see colors more vibrantly and patterns jump out at me and it's easier for me to ask strangers questions, or strike up new conversations. Travel opens me up, just opens my heart up really wide. 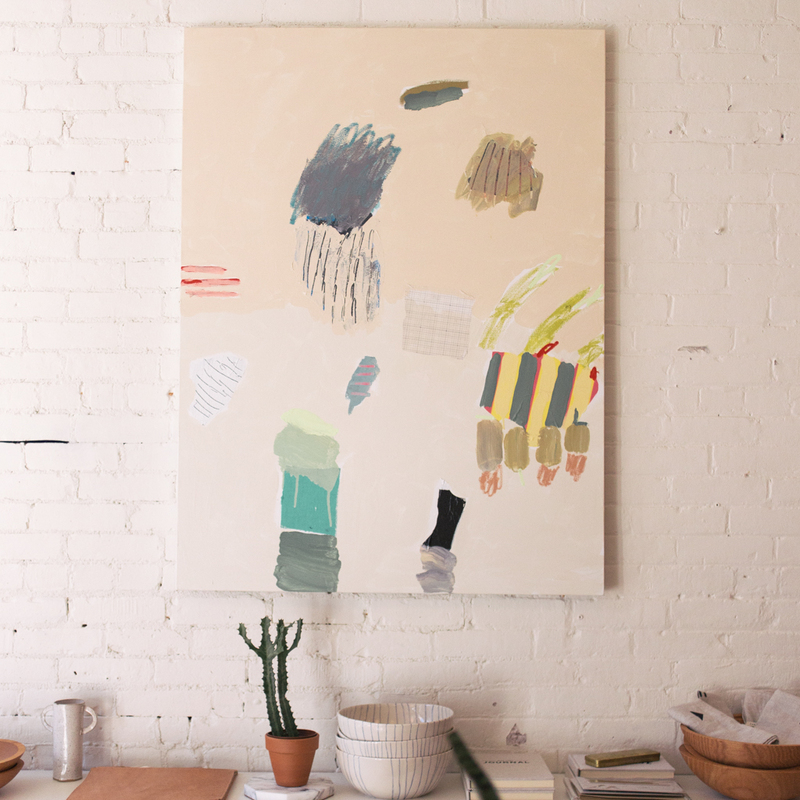 Aside from all the textiles that are on display, Caroline’s studio acts as a showcase for her paintings as well. 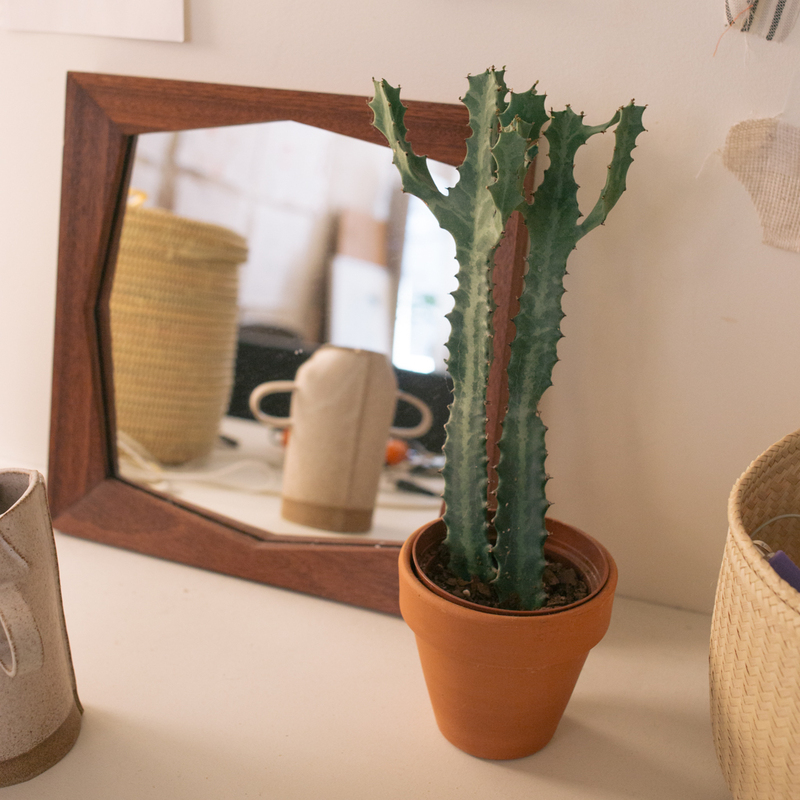 Cacti and succulents are a key feature of Caroline’s studio space. The linoleum Caroline uses to print her patterns is soft and supple, and it smells like pencil erasers too.